I like this show a lot, and in addition to watching it, I like collecting shirts, books, and other items about the show, both officially licensed and sometimes fan made. 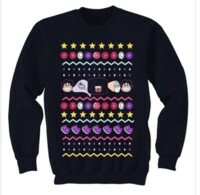 Check out my collection, or my related wish lists at Cartoon Network or Hot Topic. 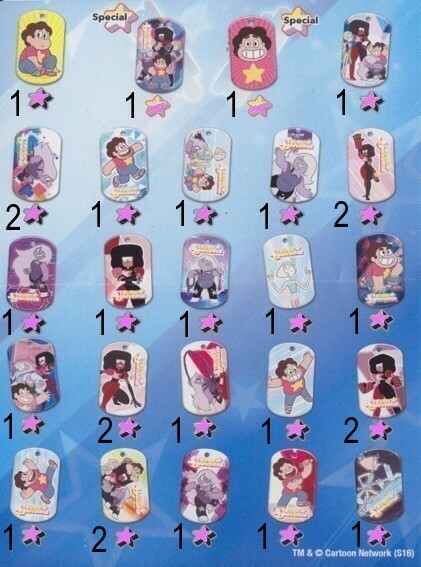 Steven Universe Guide to the Crystal Gems. Guidebook to the characters, owned in hardcover, bought from Amazon. Steven Universe Quest for Gem Magic. Activity book, owned in hardcover, bought from Amazon. Steven Universe Mad Libs. Activity book, two copies owned in softcover, one bought from Amazon and one was a gift. Steven Universe All-in-One Edition. Comic compilation of more than 30 issues of the comics, purchased in trade hardcover, preordered from Amazon (to arrive in July 2019). 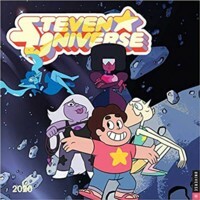 Steven Universe Volume 1. Comic compilation of issues 1 through 4, owned in trade paperback, bought from Amazon. Steven Universe Volume 2. Comic compilation of issues 5 through 8, owned in trade paperback, bought from Amazon. Steven Universe and the Crystal Gems. 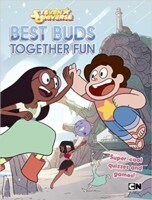 Comic compilation of the four issues (plus cover gallery) of the comic run Steven Universe and the Crystal Gems, owned in trade paperback, bought from Amazon. Steven Universe Warp Tour (Volume 1). Comic compilation of the first four issues of the ongoing comic series, bought from Amazon. Steven Universe Punching Up (Volume 2). Comic compilation of issues five through eight of the ongoing comic series, bought from Amazon. Steven Universe Field Researching (Volume 3). Comic compilation of issues nine through twelve of the ongoing comic series, bought from Amazon. Steven Universe Just Right (Volume 4). Comic compilation of issues thirteen through sixteen of the ongoing comic series, bought from Amazon. Steven Universe Too Cool for School. First original graphic novel. Bought from the local comic shop. Steven Universe Anti-Gravity. Second original graphic novel. Bought from Amazon. Steven Universe The Ultimate Dough-Down. Third original graphic novel. Purchased from Amazon. 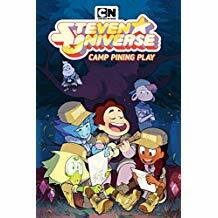 Steven Universe Camp Pining Play. Fourth original graphic novel. Preordered from Amazon, to arrive April 2019. Steven Universe What in the Universe. Trivia book, bought in paperback from Amazon. 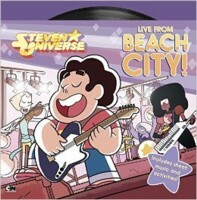 Steven Universe Live from Beach City. Songbook, bought in paperback from Amazon. Steven Universe Best Buds Together Fun. Quiz and activity book, bought from Amazon. 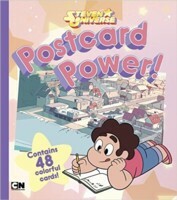 Steven Universe Postcard Power. Postcard pullout book, bought from Amazon. The Answer, a children's book about Ruby and Sapphire. Purchased from Amazon. Keep Beach City Weird, a humor book of Ronaldo's conspiracy theory documentations. Paperback bought from Amazon. 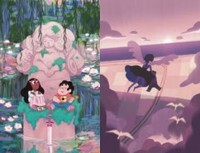 Steven Universe: Art and Origins is a collection of history and illustrations about the show. Purchased from Amazon. 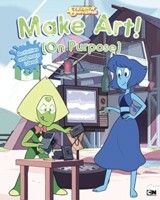 Steven Universe: Make Art! On Purpose! 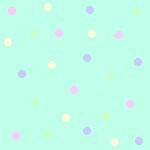 is a collection of innovative art ideas. Bought from Amazon. 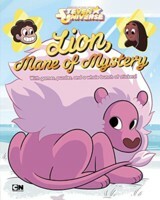 Steven Universe: Lion, Mane of Mystery is a Lion-themed activity book. Bought from Amazon. 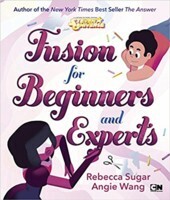 Steven Universe: Fusion for Beginners and Experts is a book about relationships (put in context through fusion). Bought from Amazon. The Steven Universe blank sketchbook: Rebecca Sugar edition. Bought from Amazon. 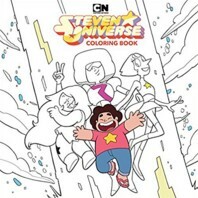 The Steven Universe coloring book. Two copies purchased from Amazon. 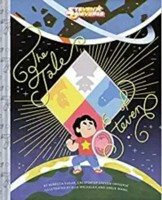 The Tale of Steven storybook. Preordered from Amazon, to arrive October 2019. Steven Universe Comic Issue 1: 8 covers collected: Bridget Underwood (bought on eBay), Andrea Fernandez (KaBOOM! Studios), Coleman Engle (eBay), Matt Cummings (eBay), Steven Sugar (eBay), Coleman Engle (Titan Comics), Grace Kraft (Etsy), blank sketch cover (eBay). Missing covers by Rebecca Sugar and Amber Rogers. 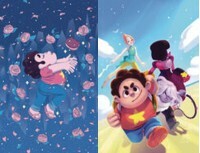 Steven Universe Comic Issue 2: 3 covers collected: George Caltsoudas (2 copies: bought from KaBOOM! Studios and the local comic store), Felicia Choo (eBay), Amber Rogers (eBay). Steven Universe Comic Issue 3: 2 covers collected: Amber Rogers (bought from eBay) and Meg Gandy (KaBOOM! Studios). Missing cover by George Caltsoudas. 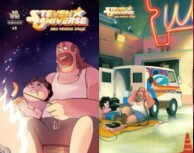 Steven Universe Comic Issue 4: 3 covers collected: Matt Cummings (2 copies: bought from KaBOOM! Studios and the local comic shop), Josceline Fenton (eBay), and Tiffany Ford (eBay). Steven Universe Comic Issue 5: 3 covers collected: Amber Rogers (bought from KaBOOM! Studios), Grace Kraft (bought from Grace directly), and Helen Yoon (bought from Grace Kraft's collection). Steven Universe Comic Issue 6: 2 covers collected: Tait Howard (bought from eBay) and Meg Gandy (bought from Grace Kraft's collection). Missing cover by Helen Yoon. Steven Universe Comic Issue 7: 2 covers collected: Amber Rogers (bought from eBay) and Becky Dreistadt (bought from KaBOOM! Studios). Missing cover by Helen Yoon. Steven Universe Comic Issue 8: 3 covers collected: Amber Rogers (bought from KaBOOM! Studios), Melanie Herring (eBay), and Helen Yoon (eBay). Steven Universe and the Crystal Gems Comic Issue 1: 9 covers collected: Kat Leyh (bought from my local comic shop), Allison Strejlau (Dreamland Comics), Missy Pena (eBay), Sam Davies (eBay, 2 copies), Jeremy Sorese (eBay), Josceline Fenton (eBay), Allison Strejlau (eBay), Steven Sugar (eBay), and Amber Rogers (eBay). 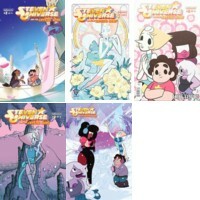 Steven Universe and the Crystal Gems Comic Issue 2: 5 covers collected: Kat Leyh (bought from my local comic shop), Missy Pena (eBay), Sam Davies (eBay, 2 copies), Jeremy Sorese (Dreamland Comics), and Mildred Lewis (eBay). 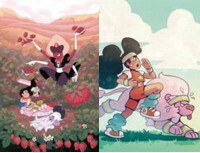 Steven Universe and the Crystal Gems Comic Issue 3: 5 covers collected: Kat Leyh (bought from my local comic shop), Missy Pena (eBay), Sam Davies (eBay, 2 copies), Jeremy Sorese (Dreamland Comics), and Josceline Fenton (eBay). 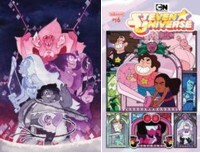 Steven Universe and the Crystal Gems Comic Issue 4: 5 covers collected: Kat Leyh (bought from my local comic shop), Missy Pena (eBay), Sam Davies (eBay, 2 copies), Jeremy Sorese (eBay), and Raven Molissee (eBay). 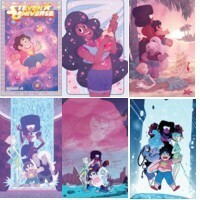 Steven Universe Ongoing Comic #1: 6 covers collected: 4 covers by Missy Pena (main cover bought from my local comic shop; Fried Pie, Wondercon Exclusive, and Foil Exclusive bought on eBay), 1 cover by Rian Sygh (eBay), 1 cover by Jenn St-Onge (eBay). Steven Universe Ongoing Comic #2: 3 covers collected: Missy Pena (bought from my local comic shop), Rian Sygh (eBay), and Jenn St-Onge (eBay). Steven Universe Ongoing Comic #3: 3 covers collected: Missy Pena (bought from my local comic shop), Rian Sygh (eBay), and Jenn St-Onge (eBay). Steven Universe Ongoing Comic #4: 3 covers collected: Missy Pena (bought from my local comic shop), Rian Sygh (eBay), and Jenn St-Onge (eBay). 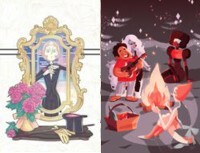 Steven Universe Ongoing Comic #5: 4 covers collected: Missy Pena (bought from my local comic shop), Rian Sygh (eBay), Sara Talmadge (eBay), and Paulina Ganucheau (eBay). 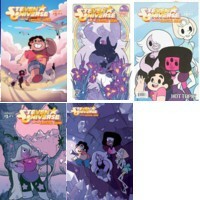 Steven Universe Ongoing Comic #6: 3 covers collected: Missy Pena (bought from Dreamland Comics), Josceline Fenton (eBay), and Sara Talmadge (eBay). 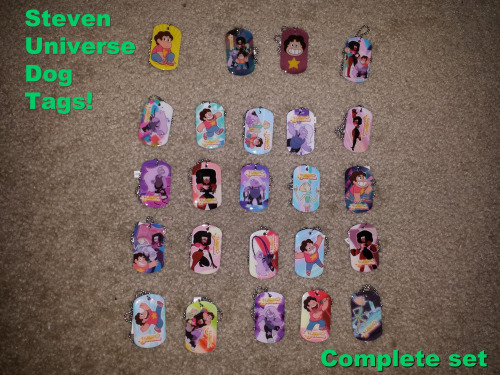 Steven Universe Ongoing Comic #7: 3 covers collected: Missy Pena (bought from eBay), Josceline Fenton (eBay), and Sara Talmadge (eBay). 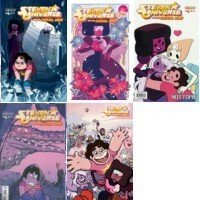 Steven Universe Ongoing Comic #8: 4 covers collected: Missy Pena (bought from my local comic shop), Paulina Ganucheau (eBay), Sara Talmadge (eBay), and Joey Granger (eBay). Steven Universe Ongoing Comic #9: 2 covers collected: Missy Pena (bought from my local comic shop) and Sibylline Meynet (eBay). Steven Universe Ongoing Comic #10: 2 covers collected: Missy Pena (bought from my local comic shop) and Natalie Dombois (Dreamland Comics). Steven Universe Ongoing Comic #11: 2 covers collected: Missy Pena (bought from eBay) and Kat Tsai (bought from my local comic shop). Steven Universe Ongoing Comic #12: 2 covers collected: Missy Pena (bought from eBay) and Natalie Dombois (bought from my local comic shop). Steven Universe Ongoing Comic #13: 2 covers collected: Missy Pena (bought from my local comic shop) and Miracle Mosley (eBay). Steven Universe Ongoing Comic #14: 2 covers collected: Missy Pena (bought from my local comic shop) and Eleanora Bruni (eBay). 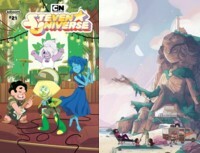 Steven Universe Ongoing Comic #15: 2 covers collected: Joey Granger (bought from my local comic shop) and Jade F. Lee (njoy). Steven Universe Ongoing Comic #16: 2 covers collected: Missy Pena (bought from my local comic shop) and Casey Dimoff (njoy). Steven Universe Ongoing Comic #17: 2 covers collected: Missy Pena (bought from my local comic shop) and Meg Omac (eBay). Steven Universe Ongoing Comic #18: 2 covers collected: Missy Pena (bought from my local comic shop) and Meg Omac (eBay). Steven Universe Ongoing Comic #19: 2 covers collected: Missy Pena (bought from my local comic shop) and Janie Lee (eBay). Steven Universe Ongoing Comic #20: 2 covers collected: Missy Pena (bought from my local comic shop) and Caitlyn Kurlich (eBay). Steven Universe Ongoing Comic #21: 2 covers collected: Missy Pena (bought from my local comic shop) and Scott Maynard (eBay). Steven Universe Ongoing Comic #22: 2 covers collected: Missy Pena (bought from my local comic shop) and Lanna Souvanny (eBay). 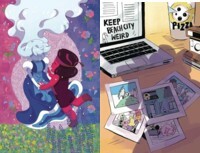 Steven Universe Ongoing Comic #23: 2 covers collected: Missy Pena and Alex Chiu (both bought from my local comic shop). Steven Universe Ongoing Comic #24: 2 covers collected: Missy Pena and Ayme Sotuyo (both bought from my local comic shop). 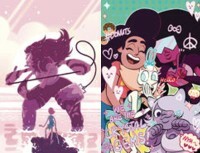 Steven Universe Ongoing Comic #25: 4 covers collected: Missy Pena and Francesca Perrone (both bought from my local comic shop), Jen Bartel (eBay), and Xiao Tong Kong (eBay). 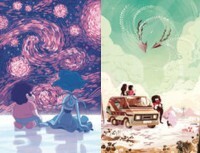 Steven Universe Ongoing Comic #26: 3 covers collected: Missy Pena and Francesca Perrone (both bought from my local comic shop), and Xiao Tong Kong (eBay). 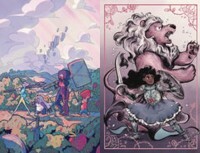 Steven Universe Comic Miniseries Harmony #1: 5 covers collected: Marguerite Sauvage, Savanna Ganucheau, Veronica Fish, Brittney Williams, and Sara Talmadge (all bought from eBay). 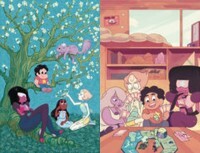 Steven Universe Comic Miniseries Harmony #2: 2 covers collected: Marguerite Sauvage (bought from my local comic shop) and Savanna Ganucheau (eBay). Steven Universe Comic Miniseries Harmony #3: 2 covers collected: Marguerite Sauvage (bought from my local comic shop) and Savanna Ganucheau (eBay). 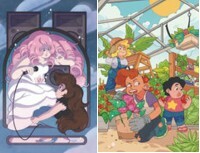 Steven Universe Comic Miniseries Harmony #4: 2 covers collected: Marguerite Sauvage (bought from my local comic shop) and Savanna Ganucheau (eBay). Steven Universe Comic Miniseries Harmony #5: 2 covers collected: Marguerite Sauvage (bought from my local comic shop) and Savanna Ganucheau (eBay). Steven Universe Greg Universe Special Issue 1: Cover by Ru Xu (bought from KaBOOM! Studios). Missing cover by Fellipe Martins. Steven Universe 2016 Special #1: 3 covers collected: Ayme Sotuyo (bought from my local comic shop), Katie Jones (eBay), and Missy Pena (Amazon). 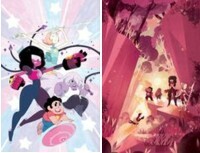 Steven Universe Fusion Frenzy #1: 4 covers collected: Two aligning covers by Nathalie Fourdraine (bought from my local comic shop), one variant by Abigail L. Dela Cruz (eBay), and one variant by Alexandra Lillie (eBay). The San Diego Comic Con zine set by Lauren Zuke and Mira W. They're all the same content but have different covers. Given out at the comic con but purchased through eBay. Volume 1 of a zine summing up Grace Kraft's comic issues in the ongoing comic series. Sent to me by Grace Kraft. BOOM! Studios' Halloween Haunt compilation in 2015 included 3 tales from Adventure Time, Steven Universe, and Lumberjanes. 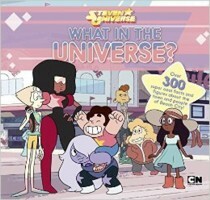 The SU comic was an extract from the longer piece "Wild Animals" from a different comic. Bought on eBay. An Adventure Time comic included the first appearance of Steven Universe comic material (a story later included in the first original trade paperback). Bought on eBay. 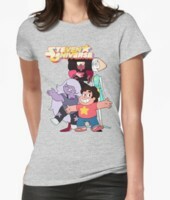 Shirt featuring the Gems and Steven eating a Cookie Cat. A licensed item bought from Hot Topic. 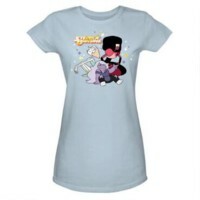 Shirt featuring Amethyst with her whip. A licensed item bought from Hot Topic. Sleeveless shirt featuring Pearl in a dance pose. A licensed item bought from Hot Topic. 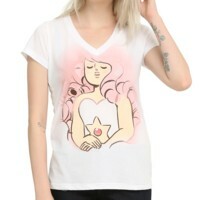 Shirt featuring the portrait of Rose Quartz. A licensed item bought from Hot Topic. Shirt bearing a Cookie Cat design. A licensed item bought from Hot Topic. 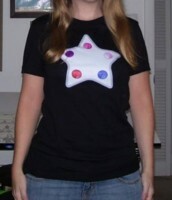 Shirt with Steven's star and a pinker fabric, designed to work with Stevonnie cosplays more accurately. A licensed item bought from Hot Topic. 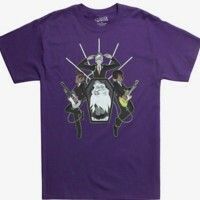 Shirt featuring four Stevens. A licensed item bought from Hot Topic. 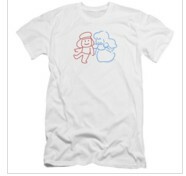 Shirt picturing Ruby and Sapphire engaged in public displays of affection. A licensed item bought from Hot Topic. 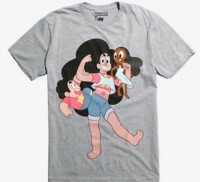 Shirt picturing Connie and Steven being carried by their Fusion, Stevonnie. A licensed item bought from Hot Topic. Shirt picturing Sugilite with a Japanese monster poster theme. A licensed item bought from Hot Topic. 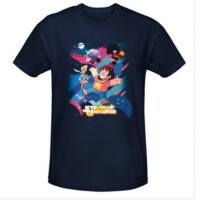 Shirt picturing Steven, Lion, and Lapis Lazuli. A licensed item bought from Hot Topic. 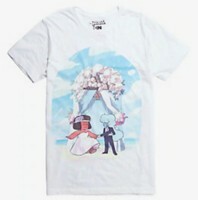 Shirt picturing Ruby and Sapphire's wedding. A licensed item bought from Hot Topic. 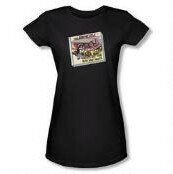 Shirt featuring Sadie Killer and the Suspects. A licensed fan-designed item bought from Hot Topic. 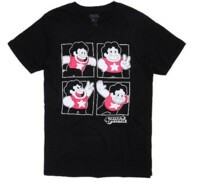 Shirt picturing the Jam Buds Steven and Connie. 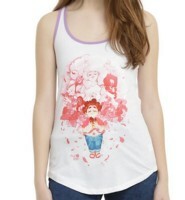 A licensed fan-designed item bought from Hot Topic. 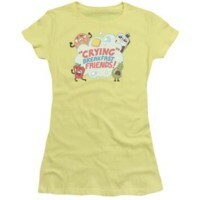 Shirt with the Crying Breakfast Friends logo. A licensed item bought from Cartoon Network's shop. 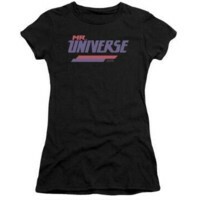 Shirt featuring the Mr. Universe logo. A licensed item bought from Cartoon Network shop. Shirt featuring Mr. Universe's CD "Let Me Drive My Van (Into Your Heart)." A licensed item bought from Cartoon Network shop. 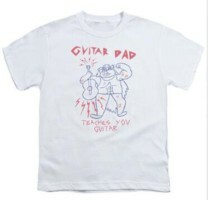 Shirt featuring Steven's "Guitar Dad" drawing from the episode "Shirt Club." A licensed item bought from Cartoon Network shop. 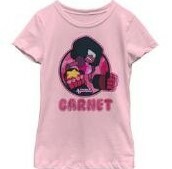 Shirt featuring Garnet in a circle frame. A licensed item bought from Cartoon Network shop. 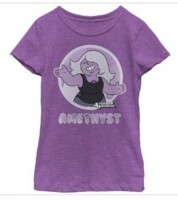 Shirt featuring Amethyst in a circle frame. A licensed item bought from Cartoon Network shop. 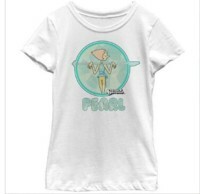 Shirt featuring Pearl in a circle frame. A licensed item bought from Cartoon Network shop. 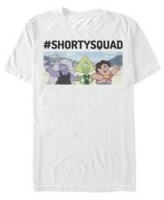 Shirt featuring the Shorty Squad (Amethyst, Peridot, Steven) from the episode "Too Short to Ride." A licensed item bought from Cartoon Network shop. 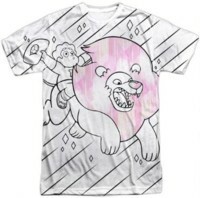 Shirt with a sublimated design of Steven riding on Lion. A licensed item bought from Cartoon Network shop. 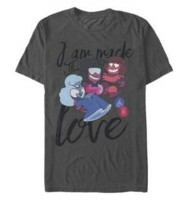 Shirt picturing Garnet holding Ruby and Sapphire, labeled "I Am Made of Love." A licensed item bought from Cartoon Network shop. 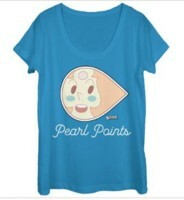 Shirt picturing the Pearl sticker for Pearl Points from the episode "Steven vs. Amethyst." A licensed item bought from Cartoon Network shop. 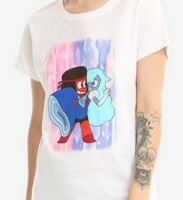 Shirt featuring the Gems and the show logo. A licensed item bought from Cartoon Network shop. 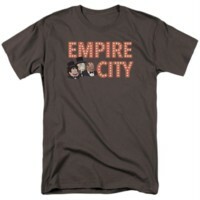 Shirt featuring Pearl, Steven, and Greg with the Empire City lights. A licensed item bought from Cartoon Network shop. Shirt featuring the stamp Ruby and Sapphire used on wedding invitations. A licensed item bought from Cartoon Network shop. 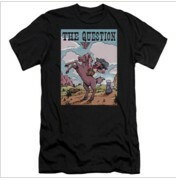 Shirt featuring comic book art modeled after Ruby's cowboy image from the episode "The Question." A licensed item bought from Cartoon Network shop. 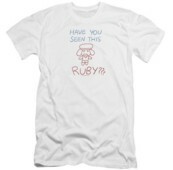 Shirt featuring Ruby's missing poster. A licensed item bought from Cartoon Network shop. 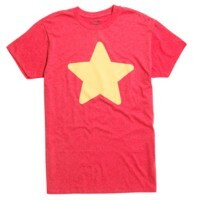 Shirt with Steven's signature star on it. Sold from Hot Topic, but I bought it on Amazon. 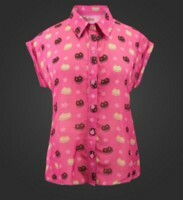 Chiffon collared Cookie Cat shirt. A licensed fan design bought from WeLoveFine. 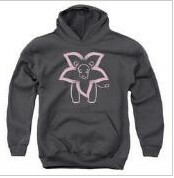 Hoodie featuring Lion. A licensed item bought from Cartoon Network shop. Gem patterns on a sweater. A licensed item bought from Cartoon Network shop. 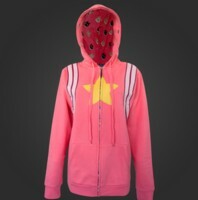 Hoodie featuring a cheeseburger backpack design on the back, a Steven-esque star on the front, and a hoodie lining with Cookie Cats on it. A licensed fan design bought from WeLoveFine. 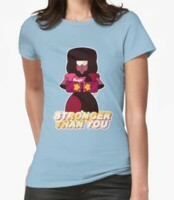 Shirt featuring Garnet and her signature phrase "Stronger Than You." A fan-made item bought from Redbubble. 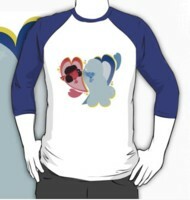 Shirt featuring stylized drawings of Ruby and Sapphire. A fan-made item bought from Redbubble. Shirt featuring the Crystal Temple's star. A fan-made item bought from Redbubble. Shirt featuring the main cast of the show. A fan-made item bought from Redbubble. 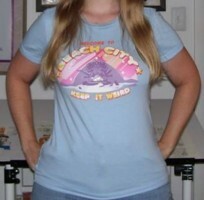 Shirt featuring a reference to "Keep Beach City Weird," which is the title of character Ronaldo's blog. A fan-made item bought from Redbubble. 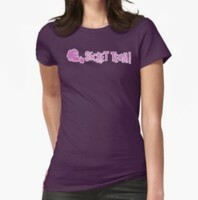 Shirt featuring the logo from "Secret Team." A fan-made item bought from Redbubble. 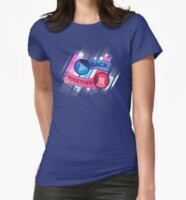 Shirt featuring Ruby and Sapphire gems with the phrase "Back Together." A fan-made item bought from Redbubble. 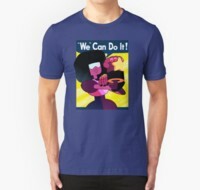 Shirt depicting Garnet in the classic Rosie the Riveter image design. A fan-made item bought from Redbubble. Shirt featuring the logo from the Big Donut, which I wore when I was Sadie for Halloween. A fan-made item bought from Redbubble. 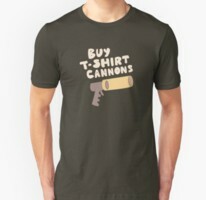 Shirt featuring an advertisement for T-shirt cannons, which is a joke from the show. A fan-made item bought from Redbubble. 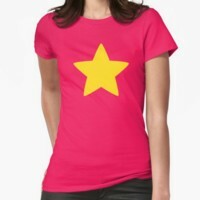 Shirt with Steven's famous star on it, printed on a pinker color than the red shirt sold licensed. A fan-made item bought from Redbubble. A dress inspired by Garnet's outfit from the show. A licensed item bought from Hot Topic. 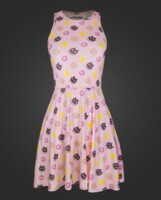 A dress with all-over Cookie Cat print mixed in with Rose Quartz gemsones and stars. A licensed item bought from We Love Fine. 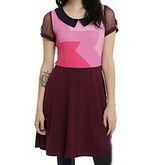 A dress with a Steven star on the chest and Steven Gems on the skirt. A licensed item bought from ThinkGeek. A dress inspired by Rose Quartz's outfit from the show. A licensed item bought from Hot Topic. An athletic top featuring Garnet's outfit design. A fan item bought from Crystal Clods. Steven Universe boxers. A licensed item bought from Hot Topic. 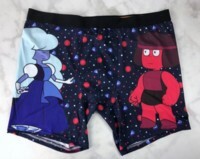 Garnet/Ruby/Sapphire boxers. A licensed item distributed by Loot Undies, but bought from eBay. Cookie Cat leggings. A licensed item bought from WebUndies through Amazon. Amethyst-inspired leggings. A licensed item bought from Hot Topic. A Halloween costume for Garnet that includes the shirt, pants, gloves, and visor. Purchased from Spirit Halloween. A pajama-like suit in the shape of Lion. A licensed item purchased from ThinkGeek. A hat Steven's signature colors and star. A licensed item bought from Amazon. 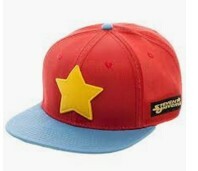 A hat with a star on the front and Gems on the brim. A licensed item bought from Spencer's. A Mr. Universe hat. A licensed item bought from Amazon. A soft hat with a star on the top in SU colors. A licensed item bought from Hot Topic. 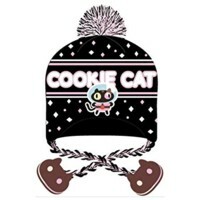 A soft hat with Cookie Cat on it, with Cookie Cats on strings from the sides too. A licensed item bought from Amazon. 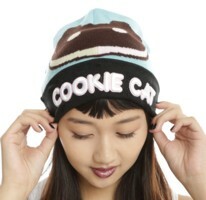 A soft hat with Cookie Cat images. A licensed item bought from Hot Topic. 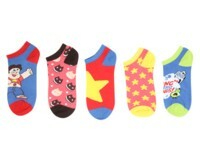 A set of no-show socks with Steven Universe�inspired designs on them. An official item from Hot Topic. A set of no-show socks with Rose Quartz on them. An official item from Hot Topic. A set of no-show socks featuring images from the Reunited arc. An official item from Hot Topic. 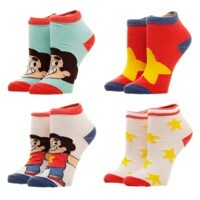 A set of ankle socks with Steven Universe�inspired designs on them. An official item from Amazon. 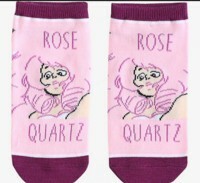 A set of no-show socks with Steven Universe character designs on them. An official item from Hot Topic. 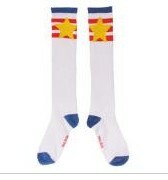 A pair of knee socks with Steven-inspired stars. An official item from the Cartoon Network shop. 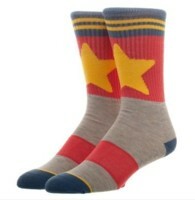 A pair of knee socks with Steven-inspired stars, slightly different from above. An official item from Bioworld, received as a gift from a big box store. 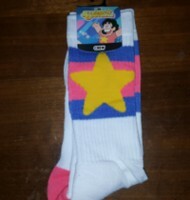 A set of tube socks with Steven on them. An official item from Toynk Toys but purchased through Amazon. Steven Universe crew socks with Steven's star. An official item from Bioworld by I bought from eBay. 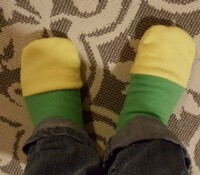 A set of Peridot-style bootie socks. A fan-made item crafted by Kari. 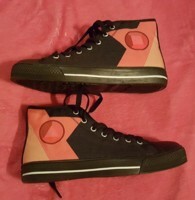 A pair of high-top shoes with Garnet-inspired gem designs. An unofficial design bought from the Lonely Pirate. A pair of fingerless gloves with Steven-inspired stars. A licensed item bought at Hot Topic. A pair of crocheted fingerless gloves with a Garnet-inspired design. A fan-made item created by OliveandBrook on Etsy (got as a gift). 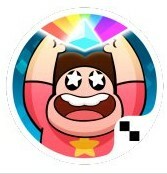 The official Steven Universe mobile app video game Attack the Light. Bought from the Google Play store. 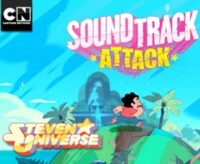 The official Steven Universe mobile app video game Soundtrack Attack. Downloaded from the Google Play store. 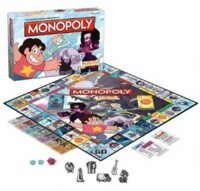 The official Steven Universe Monopoly board game. Bought from the Cartoon Network online shop. 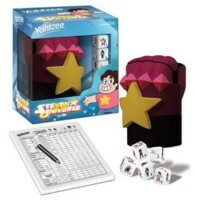 The official Steven Universe Yahtzee game. Bought from the Cartoon Network online shop. 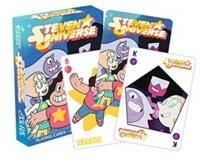 Steven Universe playing cards. Licensed product produced by Aquarius; bought from Amazon. 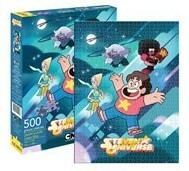 Steven Universe 500-piece jigsaw puzzle. Licensed product produced by Aquarius; bought from Entertainment Earth. 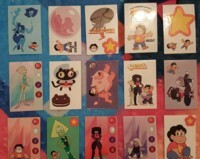 P1, P2, P3, and P5 promo cards of the upcoming Steven Universe Trading Card set. "The Answer" temporary tattoo from the book signing of The Answer. Given to me by Tumblr user modestmondays. I have 22 different designs of the stickers that come with the dog tags. Here is a photo of all the different designs I have. 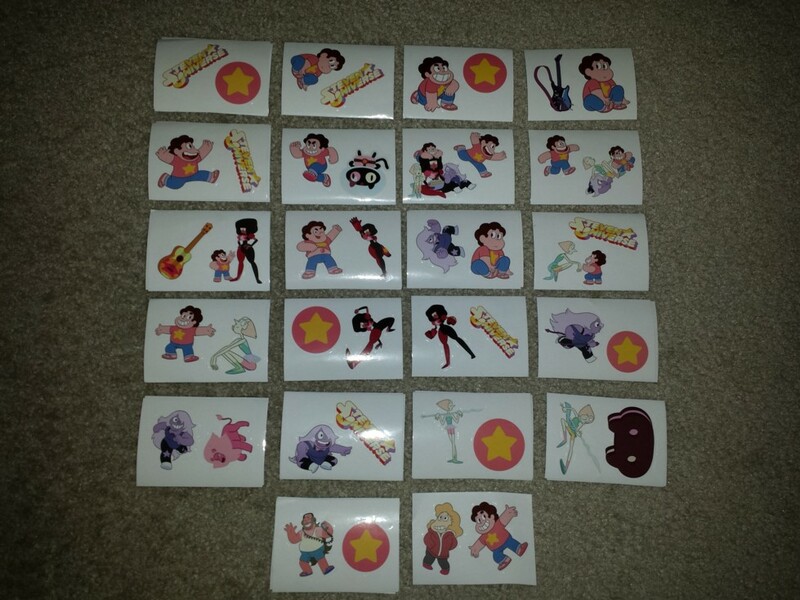 This set of 15 different collectible vending machine stickers was available on Amazon. Sticker featuring the main cast. A licensed item bought from Animewild. 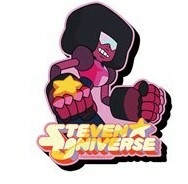 Sticker featuring Garnet ready to fight. A licensed item bought from Amazon. 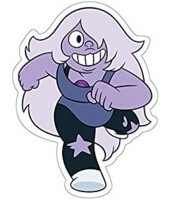 Sticker featuring Amethyst running. A licensed item bought from Amazon. Sticker featuring Pearl ready to explain things. A licensed item bought from Amazon. 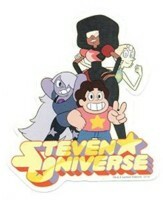 Sticker featuring Steven showing off his Gem. A licensed item bought from Hot Topic. 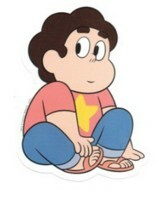 Sticker featuring Steven sitting down. A licensed item bought from Animewild. 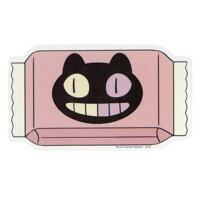 Sticker featuring a Cookie Cat snack design. A licensed item bought from Hot Topic. 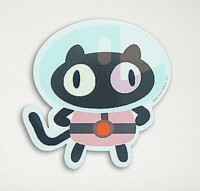 Sticker featuring a Cookie Cat character design. A licensed item bought from Spencer's. Sticker featuring a Cookie Cat cookie design. A licensed item bought from Hot Properties. 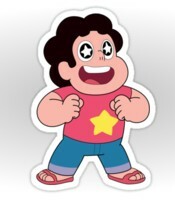 A sticker featuring Steven with star eyes. A fan-made item bought from Redbubble. 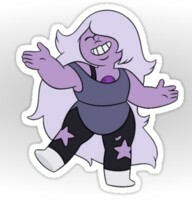 A sticker featuring Amethyst in a fun-loving pose. A fan-made item bought from Redbubble. 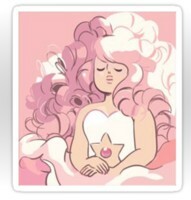 A sticker featuring the painting of Rose Quartz. A fan-made item bought from Redbubble. 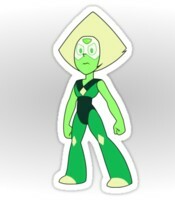 A sticker featuring Peridot, post-limb-enhancers. A fan-made item bought from Redbubble. 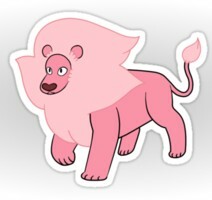 A sticker of Lion. A fan-made item bought from Redbubble. 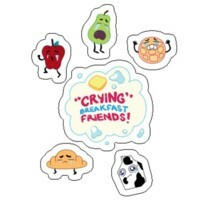 Stickers of the Crying Breakfast Friends. A fan-made item bought from Redbubble. 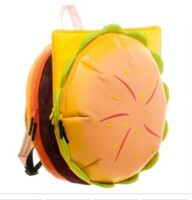 A replica of the cheeseburger backpack from the show. A licensed item bought from Cartoon Network's store. 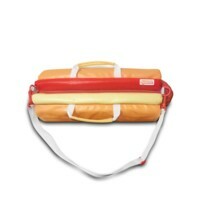 A replica of the hot dog duffel bag from the show. A licensed item bought from The Mystery Shack. 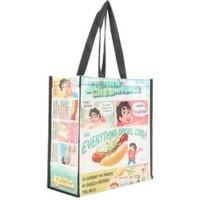 A reusable shopping bag with cute Steven comics on it. A licensed item bought from Hot Topic's online store. A reusable shopping bag with props from the show all over. A licensed item bought from Cartoon Network's store. 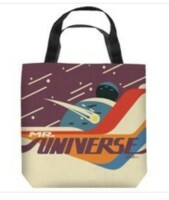 A reusable shopping bag with the Mr. Universe logo on it. A licensed item bought from FYE's online store. 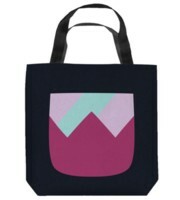 A large reusable shopping bag featuring a stylized Garnet design. 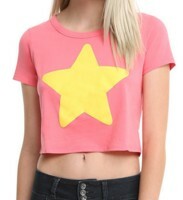 A licensed item bought from Cartoon Network's online store. A large reusable shopping bag featuring a stylized Ruby and Sapphire design. A licensed item bought from Cartoon Network's online store. 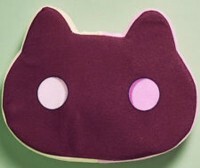 An accessory pouch with a Cookie Cat pattern. A licensed item bought from the Cartoon Network shop. 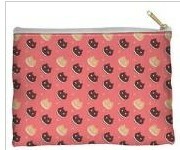 An accessory pouch with a Warp Pad illustration. A licensed item bought from the Cartoon Network shop. A kisslock wallet featuring the main cast. A licensed item bought from Hot Topic. 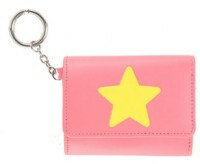 A tri-fold wallet featuring a Steven-style star. A licensed item bought from Hot Topic. A bi-fold wallet featuring the main cast. A licensed item bought from Hot Topic. A checkbook-size flap wallet featuring Steven and the logo. A licensed item bought from Amazon. 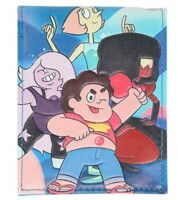 A slim ID wallet with a Steven head charm. A licensed item bought from Amazon. I have a collection of 50 of these dog tags, which come on metal chains with a sticker sheet. I have one complete set with a bunch of repeats. Here's my complete set. Here's my checklist. A rubber bracelet featuring Amethyst. A licensed item bought from Hot Topic. 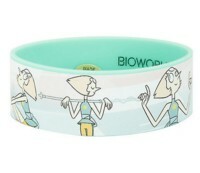 A rubber bracelet featuring Pearl. A licensed item bought from Hot Topic. A rubber bracelet featuring the "Believe in Steven" slogan. A licensed item bought from Hot Topic. 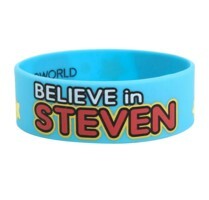 A rubber bracelet featuring a different "Believe in Steven" slogan. A licensed item bought from Hot Topic. 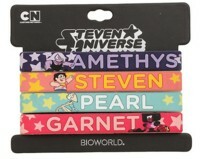 A rubber bracelet set featuring the four main Crystal Gems' names and images. A licensed item bought from Hot Topic. A rubber bracelet set featuring Ruby and Sapphire's names and images. A licensed item bought from Hot Topic. 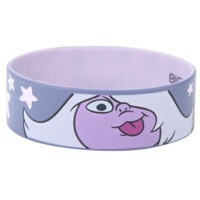 An elastic bracelet featuring Steven against a Cookie Cat background. A licensed item bought from Spencer's. 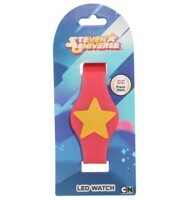 An LED watch with Steven's star on it. A licensed item bought from GameStop. An LED watch with the characters on it. A licensed item bought from GameStop. Cookie Cat earrings. A licensed item bought from Hot Topic. 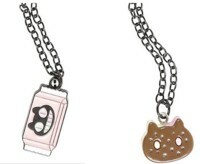 Cookie Cat necklaces. A licensed item bought from Hot Topic. A necklace of the Crystal Temple star. 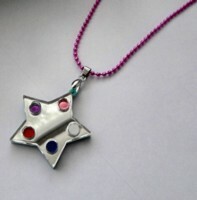 A fan-made item bought from Miyuka's store Shiny Things on Etsy. 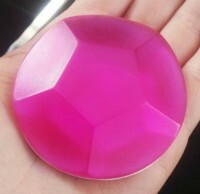 A resin gemstone made for my Stevonnie cosplay. A fan-made item bought from Chase's store HamsterParade on Etsy. 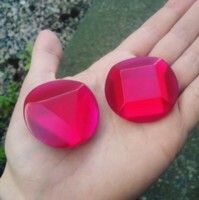 A set of resin gemstones made for my Garnet cosplay. A fan-made item bought from Chase's store HamsterParade on Etsy. 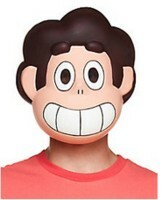 A Halloween mask of Steven. 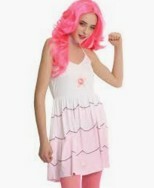 (I don't plan to use this to dress up as Steven, but thought it might be fun hanging around somewhere.) Purchased from Spirit Halloween. 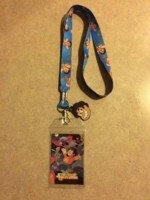 A lanyard with Steven illustrations on one side and logo illustrations on the other, with a star charm and a collectible sticker. A licensed item bought from Hot Topic. 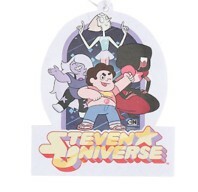 A lanyard with Steven action poses on it, with a Rose Quartz gem charm and a collectible sticker. A licensed item bought from Hobby Hunters. 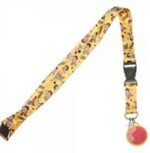 A lanyard with Steven faces on it, with a Steven's face charm and a collectible sticker. A licensed item sold from Hot Topic (and purchased on eBay). 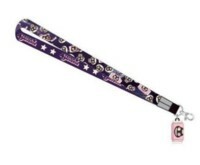 A lanyard with Cookie Cat illustrations on both sides, with a Cookie Cat charm and a collectible sticker. A licensed item bought from Hot Topic. A lanyard with space Cookie Cat and packaged Cookie Cat illustrations on both sides, with a Cookie Cat charm. A licensed item bought from the Mystery Shack. 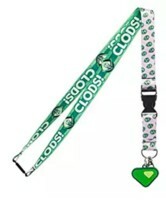 A lanyard with Big Donut illustrations on both sides and the catch phrase "Eat a Big Donut," with a Big Donut logo charm. A licensed item bought from the Mystery Shack. 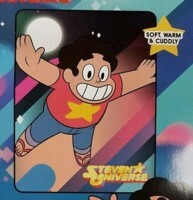 A lanyard featuring Steven illustrations and his star and his Gem. A licensed item bought from Hot Topic. A lanyard featuring Peridot symbolism. A licensed item bought from Amazon. 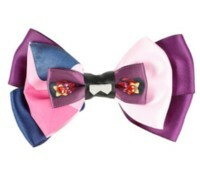 A hair bow themed after Garnet's colors and theme. A licensed item bought from Hot Topic. 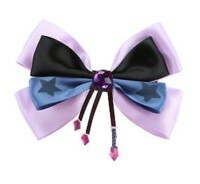 A hair bow themed after Amethyst's colors and theme. A licensed item bought from Hot Topic (but bought on eBay). 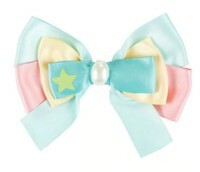 A hair bow themed after Pearl's colors and theme. A licensed item bought from Hot Topic (but bought on eBay). 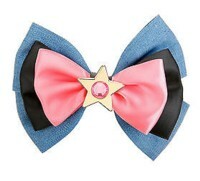 A hair bow themed after Steven's colors and theme. A licensed item bought from Hot Topic (but bought on eBay). 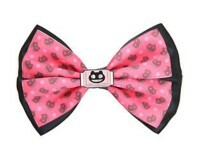 A hair bow themed after Cookie Cat's colors and theme. A licensed item bought from Hot Topic (but bought on eBay). A belt with the main characters on the band, with a seatbelt buckle. A licensed item bought from Cartoon Network. 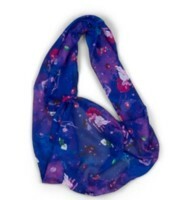 A scarf covered in SU character designs. Part of a package bought from November 2017's Loot for Her. A patch in the style of Rose Quartz's battle flag. Received as a free item from Hot Topic as part of a promotion. A pair of patches in the style Ruby and Sapphire gemstones. 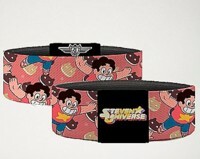 Licensed items purchased from Cartoon Network's online store. A patch featuring Garnet against the rainbow flag with the message "Made of Love." A licensed item purchased from Cartoon Network's online store. 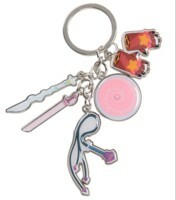 A metal keychain featuring the Crystal Gems' weapons. A licensed item bought from Hot Topic. A Funko Pop! 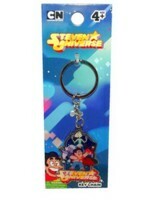 keychain in the design of Steven. A licensed item sold at Hot Topic but I bought it on eBay. A Funko Pop! 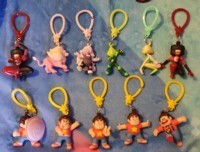 keychain in the design of a glow-in-the-dark Steven. A licensed item bought from Hot Topic. A Funko Pop! 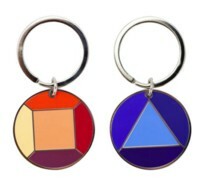 keychain in the design of Garnet. A licensed item bought from Hot Topic. A Funko Pop! keychain in the design of Pink Diamond. A licensed item bought from Hot Topic. A metal keychain of a Cookie Cat snack. A licensed item bought from Hot Topic. 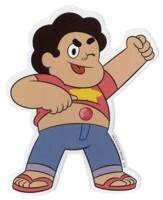 A metal keychain of Steven in an action pose. A licensed item bought from Pro Toys. A metal keychain of the Crystal Gems. A licensed item bought from Hot Properties. 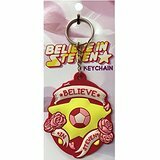 A rubber keychain featuring Steven's Gem design and a positive message. A licensed item bought from Level Up Studios. A metal keychain featuring Ruby's Gem on one side and Sapphire's Gem on the other. 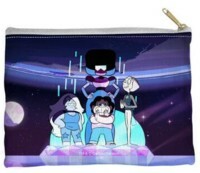 A licensed item bought from Cartoon Network's online store. A set of blind bag figure hangers. I have a complete set of 11. A licensed item distributed by UCC, bought from Amazon. 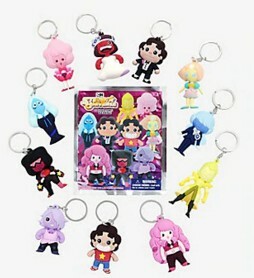 A set of blind bag figural foam keychains. I have a complete set of the 11 unique designs, and some doubles. Licensed items purchased from Hot Topic. 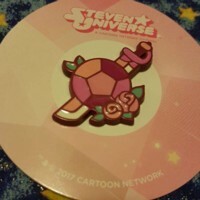 A pin featuring Rose Quartz's sword and Gem. Part of a package bought from November 2017's Loot for Her. 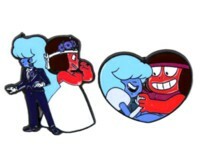 A set of two enamel pins featuring Ruby and Sapphire in a heart and Ruby and Sapphire in their wedding clothes. 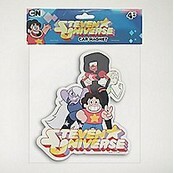 A licensed item purchased at Cartoon Network's online store. An enamel pin featuring Garnet with Pride coloration on her hair and glasses. 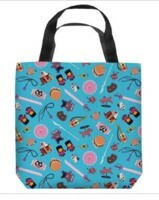 A licensed item purchased at Cartoon Network's online store. 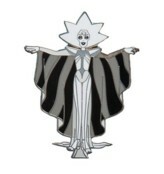 An enamel pin featuring White Diamond's full-body design. 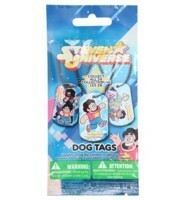 A licensed item purchased at Cartoon Network's online store. 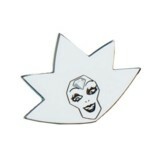 An enamel pin featuring White Diamond's head. 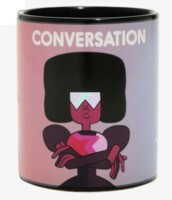 A licensed item purchased at Cartoon Network's online store. 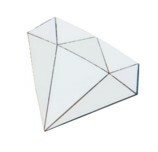 An enamel pin featuring White Diamond's Gem. 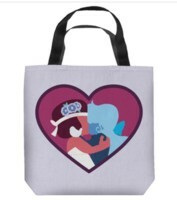 A licensed item purchased at Cartoon Network's online store. 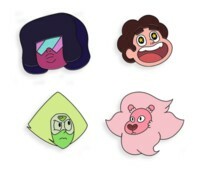 A set of four enamel pins designed by Mondo, featuring Garnet, Steven, Lion, and Peridot. A fan item from Mondo Tees. Enamel pins featuring symbols of the Crystal Temps team members Peridot, Lapis Lazuli, and Connie. Purchased from The Mystery Shack. 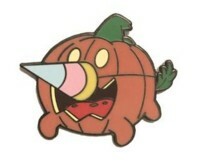 Enamel pin of Pumpkin wearing a party hat nose to impersonate Pearl. Purchased from The Mystery Shack. A button featuring the main cast of the show. Sold by Hot Topic but I bought it on eBay. A button featuring the main cast of the show. A licensed item bought at Spencer's. A button featuring Steven. Sold by Hot Topic but I bought it on eBay. 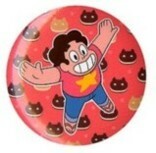 A button featuring Steven displaying his Gem. Sold by Hot Topic but I bought it on eBay. A button featuring the Crying Breakfast Friends. Sold by Hot Topic but I bought it on eBay. A button featuring Garnet. Sold by Hot Topic but I bought it on eBay. A button featuring Amethyst. Sold by Hot Topic but I bought it on eBay. 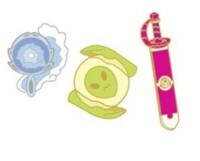 A button featuring Pearl. Sold by Hot Topic but I bought it on eBay. 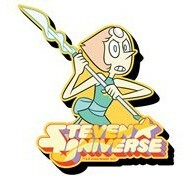 A button featuring Pearl against a star. Sold by Hot Topic but I bought it on eBay. 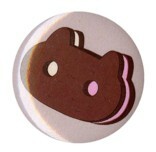 A button featuring the Cookie Cat snack. A licensed item bought at Hot Topic. A button featuring Cookie Cat. A licensed item bought at Spencer's. 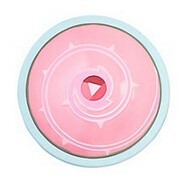 A button featuring Pink Diamond. A licensed item bought at Hot Topic. 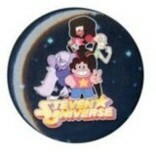 A button featuring a flying Lapis Lazuli beside Steven and Lion. Sold by Hot Topic but I bought it on eBay. A button from San Diego Comic Con 2014; purchased from eBay. A button set from San Diego Comic Con 2018; a con attendee traded me for three of these, and I got the missing one from eBay. A button set Cartoon Network books; various CN shows, with one Steven Universe button. Bought from eBay. 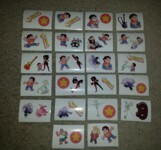 A sheet of magnets featuring the main characters. Sold by Cartoon Network but I bought it on eBay. A magnet of Steven against a Cookie Cat background. Sold by Cartoon Network but I bought it on eBay. A magnet featuring a cast shot on a black background. A licensed item bought at Spencer's. A magnet featuring a cast shot on a blue background. A licensed item bought from Hot Properties. A chunky magnet featuring a cast shot. A licensed item bought from Entertainment Earth. A chunky magnet featuring Steven. A licensed item bought from Entertainment Earth. A chunky magnet featuring Garnet. A licensed item bought from Entertainment Earth. A chunky magnet featuring Amethyst. A licensed item bought from Entertainment Earth. A chunky magnet featuring Pearl. A licensed item bought from Entertainment Earth. A car magnet featuring the main cast. A licensed item bought at Spencer's. 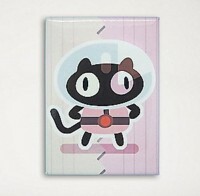 A magnet featuring Cookie Cat. A licensed item bought at Spencer's. 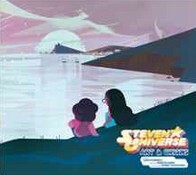 A magnet with art from one of the comic books: Steven looking at the sky. A licensed item bought at Five Below. 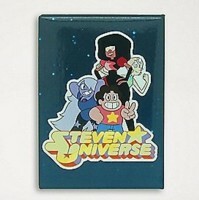 A magnet with art from one of the comic books: the Gems shopping. A licensed item bought at Five Below. A magnet with art from one of the comic books: the Gems enjoying bubbles. A licensed item bought at Five Below. 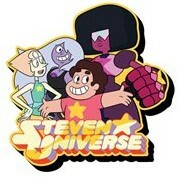 A magnet featuring the Gems drawn in the style of one of the comic book artists. A licensed item bought from Hot Properties. 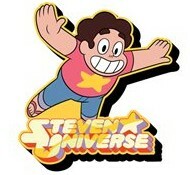 A magnet featuring a raccoon attacking Steven from the episode "On the Run." A licensed item bought from Hot Properties. A magnet featuring GUYS from the episode "Onion Trade." A licensed item bought from Hot Properties. A magnet featuring Dogcopter, who premiered in the episode "Lion 2: The Movie." A licensed item bought from Hot Properties. A magnet featuring the Crying Breakfast Friends. A licensed item bought from Hot Properties. A magnet featuring Lion making his love-me face from the episode "Lion 3: Straight to Video." A licensed item bought from Hot Properties. 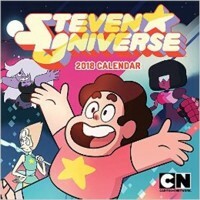 A 2018 calendar with scenes from the show. A licensed item purchased through Amazon. 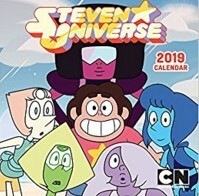 A 2019 calendar with scenes from the show. A licensed item purchased through Amazon. A 2020 calendar with scenes from the show. A licensed item preordered through Amazon. A lined blank journal with cover art featuring Lion, drawn by Sara Talmadge. A licensed item purchased from Cartoon Network's online shop. 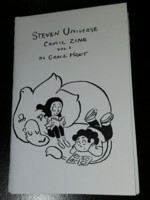 A lined blank journal with cover art featuring Garnet, drawn by Missy Pena. 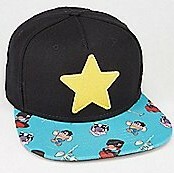 A licensed item purchased from Cartoon Network's online shop. A flag featuring Rose Quartz's symbol--the Crystal Gems' war flag. A licensed item. I own two; one is purchased from the Cartoon Network shop and one was a surprise free gift sent to customers who preordered the vinyl set. 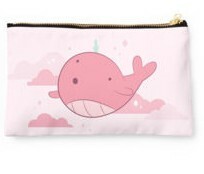 A pencil case featuring the Tiny Floating Whale design. A fan-made item bought from Redbubble. A hanging air freshener featuring the main cast. A licensed item bought from Hot Topic. 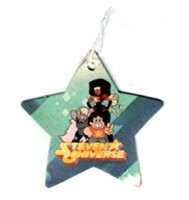 A hanging air freshener featuring the main cast in a star shape. A licensed item bought through Amazon. A hanging air freshener featuring Pink Diamond. A licensed item bought from Hot Topic. 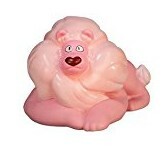 A coin bank in the shape of Lion. A licensed item sold from USAopoly and bought from Amazon. An elongated copper penny made in the penny machine at Cartoon Network. A white coffee cup featuring the four main characters running. Bought from the Cartoon Network shop. 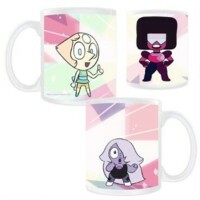 A white coffee cup featuring the Gems in their chibi forms. Bought from the Cartoon Network shop. A white coffee cup featuring the Cookie Cat logo. Bought from ThinkGeek (got as a gift). 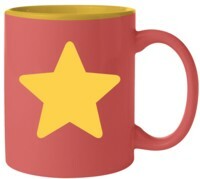 A Steven-style coffee mug with a star on it. Bought from Toynk Toys through Amazon. 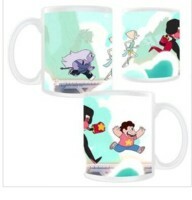 A heat-sensitive image-changing coffee cup featuring Ruby, Sapphire, and Garnet. Purchased from Hot Topic. 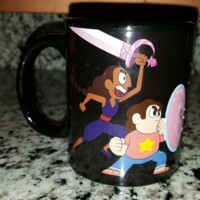 A heat-sensitive image-changing coffee cup featuring Steven, Connie, and Jasper. Purchased from an eBay seller. A tinted purple glass cup featuring the Gems. A licensed item bought from FYE. 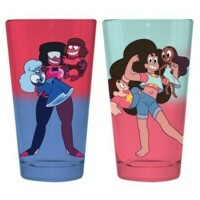 A set of two drinking glasses featuring Garnet/Sapphire/Ruby and Stevonnie/Steven/Connie. A licensed item bought from Cartoon Network's shop. 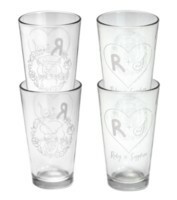 A set of two drinking glasses featuring Ruby and Sapphire on their wedding day. A licensed item bought from Cartoon Network's shop. A pint glass with artistic renditions of the characters on it. A licensed item bought from Star Force Collectibles through Amazon. A travel cup featuring the Gems and a crystalline lid. A licensed item bought from Hot Topic. 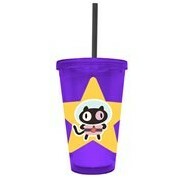 A travel cup featuring Cookie Cat and a flat lid. A licensed item bought from Entertainment Earth. A water bottle featuring the Gems. A licensed item bought from Hot Topic. A water bottle featuring Pink Diamond and glitter. A licensed item bought from Hot Topic. A water bottle featuring Cookie Cat. A licensed item bought from Entertainment Earth. A lunchbox of the Crystal Gems. A licensed item distributed by Cartoon Network but bought on eBay. 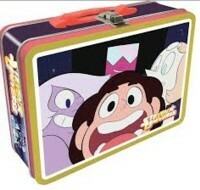 A small lunchbox featuring the Gems during the theme song opening. A licensed item distributed by Cartoon Network but bought on eBay. 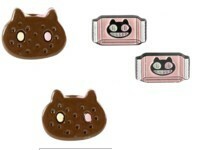 A cookie cutter set designed to make Cookie Cats. Officially distributed from Hot Topic. 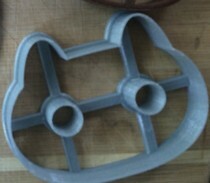 A cookie cutter designed to make Cookie Cats. 3D printed and sold on Etsy by LeahGMoloney. 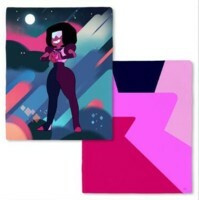 Double-sided fleece blanket featuring Garnet on one side and Garnet's design on the other. Bought from the Cartoon Network shop. 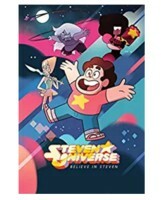 Fleece blanket featuring Steven and the show's logo. Sold through Hot Topic, but purchased on eBay. 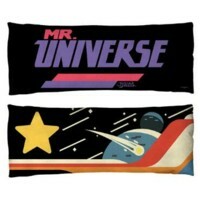 Mr. Universe body pillow. Sold through the Cartoon Network shop, but purchased on eBay. Chibi Gems body pillow. Sold through the FYE online. 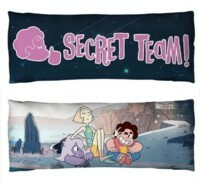 Secret Team body pillow. Sold through the FYE online. 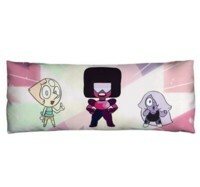 Pink Diamond and Crystal Gems pillowcases. A licensed item purchased from Hot Topic. Beach towel featuring Lion and Steven. A licensed item purchased from Amazon. A flash drive in the shape of Garnet. Her hair comes off as the cap. A fan-made item bought from Storenvy store Magic and Robots! Created by Edith EM. 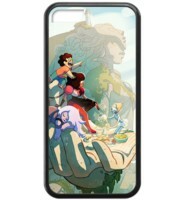 A phone case featuring the Crystal Gems, with comic book cover art by Bridget Underwood. Purchased from Case Logic (received as a gift). 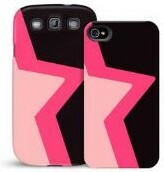 A phone case modeled after the design of Garnet's star. Purchased from Cartoon Network's store. 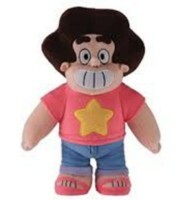 Large Plush of Steven. 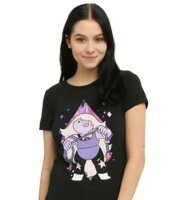 A licensed item; I have two, one bought from Hot Topic and one bought from Cartoon Network's store. 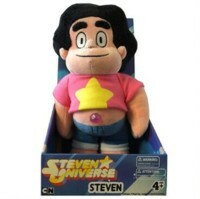 Plush of Steven. A licensed item from Toy Factory that I bought on eBay. Plush of Garnet. A licensed item from Toy Factory that I bought on eBay. Plush of Amethyst. A licensed item from Toy Factory that I bought on eBay. Plush of Pearl. A licensed item from Toy Factory that I bought on eBay. Plush of Peridot. A licensed item from Toy Factory that I bought on eBay. 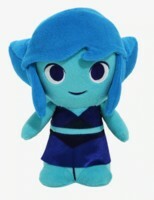 Large Plush of Lapis Lazuli. A licensed item sold at San Diego Comic Con 2017 and purchased through eBay. Large Plush of Lion. A licensed item sold at San Diego Comic Con 2017 and purchased through eBay. A licensed item sold at San Diego Comic Con 2017 and purchased through eBay. 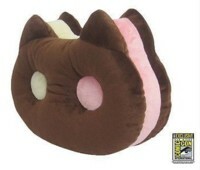 Large Plush of Cookie Cat. A licensed item sold at San Diego Comic Con 2017 and purchased through eBay. Large Plush of Yellow Diamond. A licensed item sold at San Diego Comic Con 2018 and ordered through eBay. Large Plush of Blue Diamond. A licensed item sold at San Diego Comic Con 2018 and ordered through eBay. Large Plush of Pink Diamond. A licensed item sold at San Diego Comic Con 2018 and ordered through eBay. Large Plush of Lars. A licensed item sold at San Diego Comic Con 2018 and ordered through eBay. Large Plush of Peridot looking angry. A licensed item sold at San Diego Comic Con 2018 and ordered through eBay. Large Plush of the sparkly Cookie Cat. A licensed item sold at San Diego Comic Con 2018 and ordered through eBay. Large Plush of Lion, sitting version. A licensed item sold at San Diego Comic Con 2018 and ordered through eBay. Large Plush of night palette Lion. A licensed item sold at San Diego Comic Con 2018 and ordered through eBay. 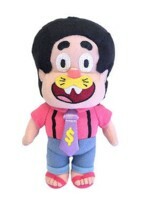 Plush of Steven as Tiger Millionaire. A licensed item sold at San Diego Comic Con 2016 and purchased through eBay. Small plush of Steven. A licensed item purchased through eBay. Small plush of Garnet. A licensed item purchased through eBay. Small plush of Amethyst. A licensed item purchased through eBay. 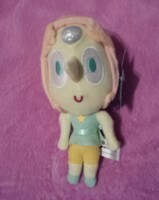 Small plush of Pearl. A licensed item purchased through eBay. 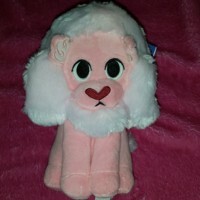 Small plush of Lion. A licensed item purchased through eBay. 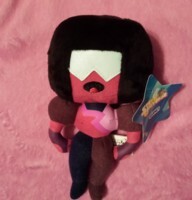 Small supercute plush of Garnet. A licensed item purchased through Hot Topic. 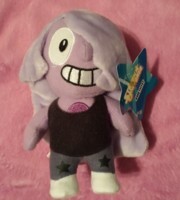 Small supercute plush of Amethyst. A licensed item purchased through Hot Topic. 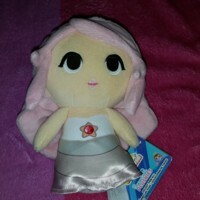 Small supercute plush of Pearl. A licensed item purchased through Hot Topic. 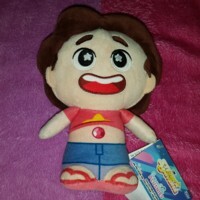 Small supercute plush of Steven. A licensed item purchased through Hot Topic. 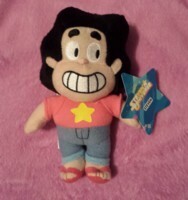 Small supercute plush of Steven with his Gem out. A licensed item purchased through GameStop. Small supercute plush of Rose Quartz. A licensed item purchased through GameStop. 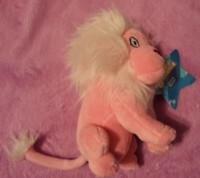 Small supercute plush of Lion. A licensed item purchased through GameStop. 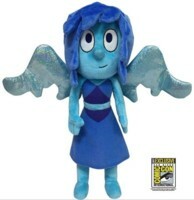 Small supercute plush of Lapis Lazuli. A licensed item purchased through Hot Topic. Small supercute plush of Peridot. A licensed item purchased through Hot Topic. 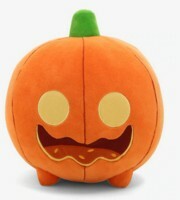 Life-size supercute plush of Pumpkin. A licensed item purchased through Hot Topic. 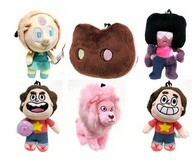 Clip-on 4-inch plush collection of 6 (Garnet, Pearl, Steven with Shield, Smiling Steven, Lion, and Cookie Cat. These are licensed items purchased through ToyWiz. 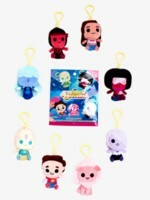 Funko Mystery Minis Plush clip-on 3-inch plush keychains from blind bags. These are licensed items purchased through Hot Topic. I have 9 of them--a complete set of 8 plus 1 Lion. LootCrate puts out LootPets and one offer was Cookie Cat. I purchased this item through eBay. Funko Vinyl Pop! 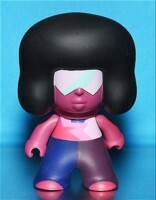 Figure of Garnet. A licensed item bought from the Cartoon Network shop. Glow-in-the-Dark Funko Vinyl Pop! Figure of Garnet. A licensed item bought from eBay. Funko Vinyl Pop! Figure of Amethyst. A licensed item bought from the Cartoon Network shop. Glow-in-the-Dark Funko Vinyl Pop! Figure of Amethyst. A licensed item bought from Hot Topic. Funko Vinyl Pop! Figure of Pearl. A licensed item bought from the Cartoon Network shop. Glow-in-the-Dark Funko Vinyl Pop! Figure of Pearl. A licensed item bought from Hot Topic. Funko Vinyl Pop! Figure of Steven. A licensed item bought from the Cartoon Network shop. Glow-in-the-Dark Funko Vinyl Pop! Figure of Steven. A licensed item bought from Hot Topic. Funko Vinyl Pop! 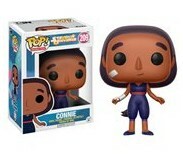 Figure of Connie. A licensed item sold at various outlets (but I bought on eBay). 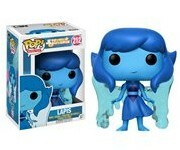 Funko Vinyl Pop! 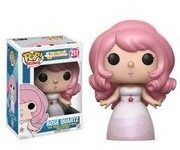 Figure of Rose Quartz. A licensed item sold at various outlets (but I bought on eBay). Funko Vinyl Pop! 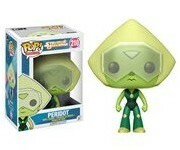 Figure of Peridot. A licensed item sold at various outlets (but I bought on eBay). Funko Vinyl Pop! Figure of Lapis Lazuli. A licensed item sold at various outlets (but I bought on eBay). Funko Vinyl Pop! Figure of Lion. A licensed item sold at various outlets (but I bought on eBay). Funko Vinyl Pop! 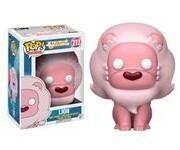 Figure of Lion, "flocked" (fuzzy) version. A licensed item sold at Hot Topic (but I bought on eBay). Funko Vinyl Pop! 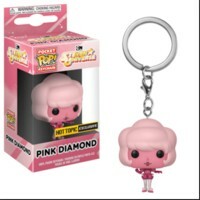 Figure of Pink Diamond. A licensed item exclusively sold at Hot Topic (but I bought it on eBay). Funko Vinyl Pop! Figure of Stevonnie. A licensed item exclusively sold at Hot Topic (but I bought it on eBay). Original Minis toys, Series 1, sold at various outlets (I purchased from toy suppliers and had to trade to get Peridot); I have 13 of these blind bag toys. 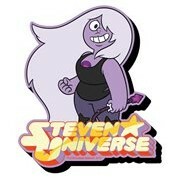 2 smiley Stevens; 2 serious Stevens; 2 smiley Garnets; 1 serious Garnet; 1 Pearl, 3 Amethysts, 1 Connie, 1 Peridot. Here is a photo of the full set. 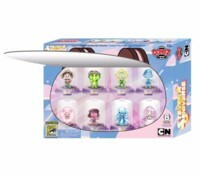 Original Minis toys, Series 1, in the special Big Donut packaging exclusive to San Diego Comic Con 2016. Purchased from an eBay seller. 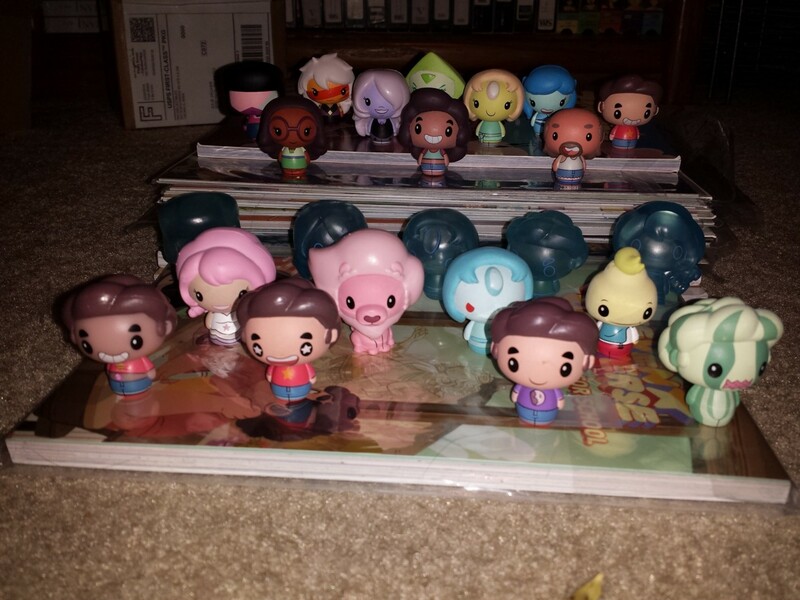 Funko Mystery Minis toys, available at GameStop, Hot Topic, and various other stores; I have 23 of these blind box toys, purchased at GameStop and eBay. 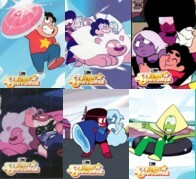 1 Steven with shield; 1 Steven showing his Gem; 1 Steven in a Big Donut shirt; 1 Steven smiling; 1 Garnet smiling; 1 Garnet with gauntlets; 1 Amethyst grinning; 1 Amethyst with whip; 1 Amethyst shapeshifted as Steven; 1 Pearl smiling; 1 Pearl with spear; 1 Rose Quartz smiling; 1 Rose Quartz in Mr. Universe shirt; 1 Peridot; 3 Lions (2 glow-in-the-dark, one not); 2 Lapis Lazulis (1 glow-in-the-dark, one not); 1 Greg Universe; 1 Connie; and 2 Onions. 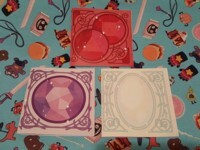 Here is a photo of my set, which is complete. 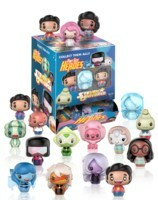 Funko Pint Size Heroes toys, available at GameStop, Hot Topic, and various other stores; I have 34 of these blind box toys, purchased at Entertainment Earth, GameStop, and eBay. 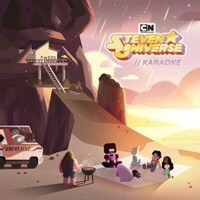 3 Smiling Stevens; 3 Star-Eyed Stevens; 1 Glow-in-the-Dark Gem Steven; 1 Donut Steven; 1 Watermelon Steven; 1 Water Construct Steven; 1 Garnet; 1 Water Construct Garnet; 1 Amethyst; 1 Water Construct Amethyst; 1 Pearl; 1 Water Construct Pearl; 1 Holo Pearl; 2 Rose Quartzes; 1 Water Construct Rose Quartz; 2 Peridots; 1 Lapis Lazuli; 2 Jaspers; 2 Connies; 2 Stevonnies; 2 Gregs; 1 Onion; 2 Lions. Here is a photo of my set, which is complete. 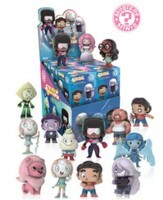 Series 1 of the Micro Pozers, including Garnet, Amethyst, Pearl, and Steven. Purchased at Toys R Us. 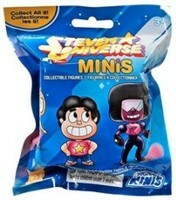 Rockerz two-pack of Steven. A licensed item sold at San Diego Comic Con 2016 and bought on eBay. Rockerz Blind Bag toys. 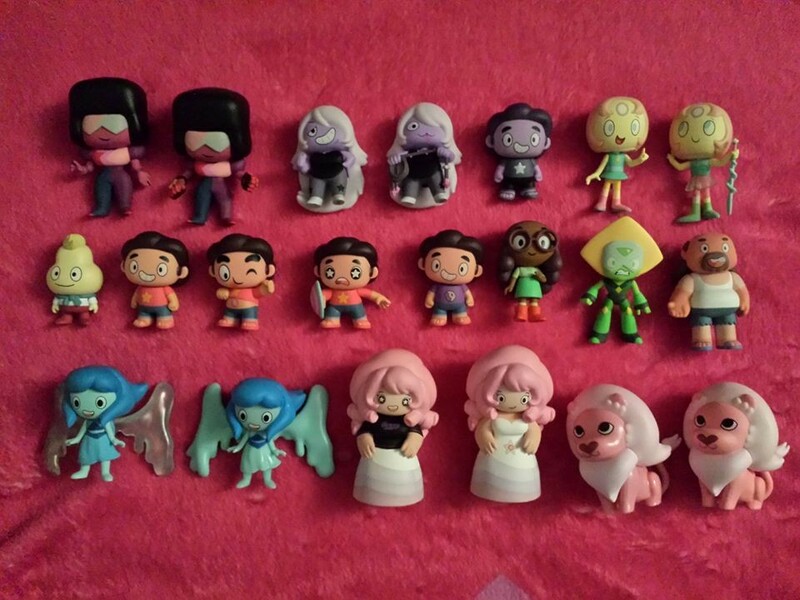 I have two Regular Stevens, one Gem Steven, one Garnet, two Amethysts, one Greg, and one Pearl. Licensed items bought from Hot Topic (and a couple on eBay). Domez are usually a blind bag item, but this is a complete set in a special box, exclusive to San Diego Comic Con 2017; I purchased it from an eBay seller. 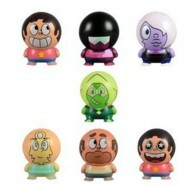 Buildable figure capsule toys, full series: Garnet, Amethyst, Pearl, two Stevens, Greg, and Peridot. Purchased from The Mystery Shack. 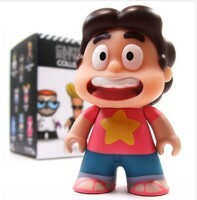 Titans Cartoon Network figure of Steven. 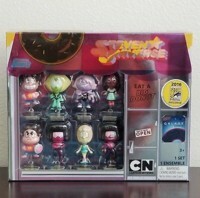 A licensed item sold by Cartoon Network and bought on eBay. 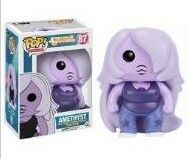 Titans Cartoon Network figure of Amethyst (shapeshifted as Steven). A licensed item sold by Cartoon Network and bought on eBay. 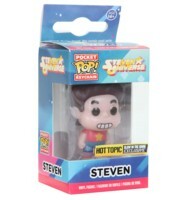 Titans Cartoon Network figure of Steven in his Big Donut shirt. A licensed item sold by Hot Topic and bought on eBay. 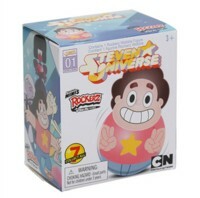 Large Titans Cartoon Network figure of Steven with his Gem on display. A licensed item sold by Hot Topic and bought on eBay. 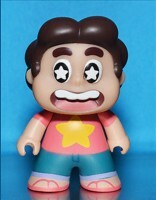 Titans Cartoon Network figure of Steven with star eyes. A licensed item sold by Cartoon Network and bought on eBay. 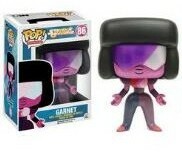 Titans Cartoon Network figure of Garnet. A licensed item sold by Cartoon Network and bought on eBay. 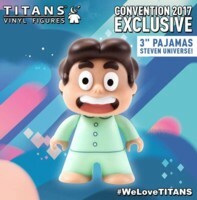 Titans Cartoon Network figure of Steven in his pajamas. A licensed item exclusive to San Diego Comic Con 2017; I ordered it from through eBay and received it from an attendee. 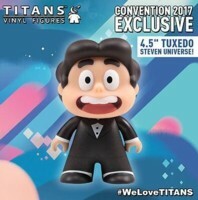 Titans Cartoon Network figure of Steven in his tuxedo. A licensed item exclusive to San Diego Comic Con 2017; I ordered it from through eBay and received it from an attendee. McFarlane Toys building set of Steven, Greg, and the Mr. Universe van. Sold through Walmart but bought on eBay. 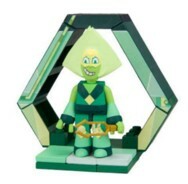 McFarlane Toys building set of Peridot on her ship. Sold through Walmart but bought on eBay. 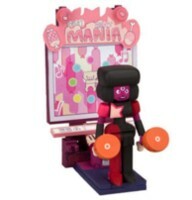 McFarlane Toys building set of Garnet playing Meat Beat Mania. Sold through Walmart but bought on eBay. 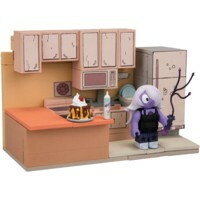 McFarlane Toys building set of Amethyst in Steven's kitchen. Sold through Walmart but bought on eBay. McFarlane Toys building set of Pearl in the arena. Sold through Walmart but bought on eBay. 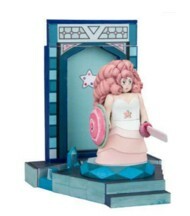 McFarlane Toys building set of Rose Quartz in front of the Crystal Temple door. Sold through Walmart but bought on eBay. Not so much a toy as a prop--Steven's Rose Quartz shield, for use as a Halloween costume prop. Bought from Spirit Halloween. 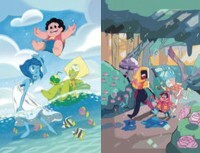 Missy Pena's limited edition print of the Crystal Gems. A licensed item purchased from the Cartoon Network shop. 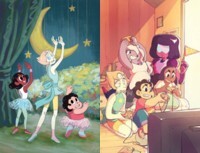 A 24 x 36 poster of the Crystal Gems in a typical promotional pose. A licensed item purchased through Amazon. 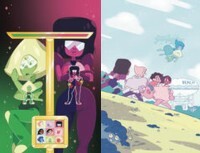 An 11 x 17 poster of the Pilot designs of the Gems. Purchased from an eBay seller. An 11 x 17 print of the signature sheet distributed at San Diego Comic Con in 2015. Purchased from The Mystery Shack. A Crewniverse-signed 11 x 17 print of the signature sheet distributed at San Diego Comic Con in 2016. Purchased from an eBay seller. An 11 x 17 print of the signature sheet distributed at San Diego Comic Con in 2017. Purchased from The Mystery Shack. An 11 x 17 print of the signature sheet distributed at San Diego Comic Con in 2018. Purchased from an eBay seller. Complete First Season DVD. Purchased from Amazon. Complete Second Season DVD. Preordered from Amazon, to arrive April 16, 2019. Volume 1 of the show through Amazon Video, packaged as "Season 1." Volume 2 of the show through Amazon Video, packaged as "Season 2." Volume 3 of the show through Amazon Video, packaged as "Season 3." 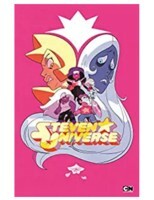 Volume 4 of the show through Amazon Video, packaged as "Season 4." Volume 5 of the show through Amazon Video, packaged as "Season 5." Volume 6 of the show through Amazon Video, packaged as "Season 6." Volume 7 of the show through Amazon Video, packaged as "Season 7." 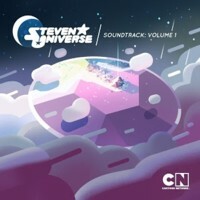 Volume 1 of the soundtrack through Google Play, owned in digital download. 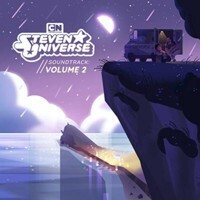 Volume 2 of the soundtrack through Amazon, owned in digital download. Karaoke soundtrack through Amazon, owned in digital download. 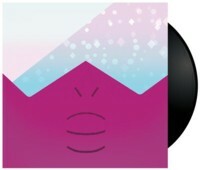 7-inch vinyl single, 3000-copy limited print run, featuring "Stronger Than You" on Side A and "Love Like You" (Live Acoustic Version) on Side B. Purchased from an eBay member who received it at San Diego Comic Con 2017. 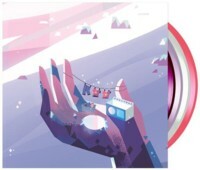 4-record 10-inch Vinyl Set is a vinyl version of the Steven Universe soundtrack. Purchased from iam8bit. 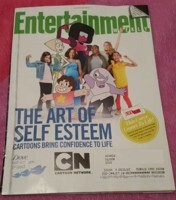 Entertainment Weekly had a cute feature about the Dove campaign that joined forces with Steven Universe. Purchased from Amazon.